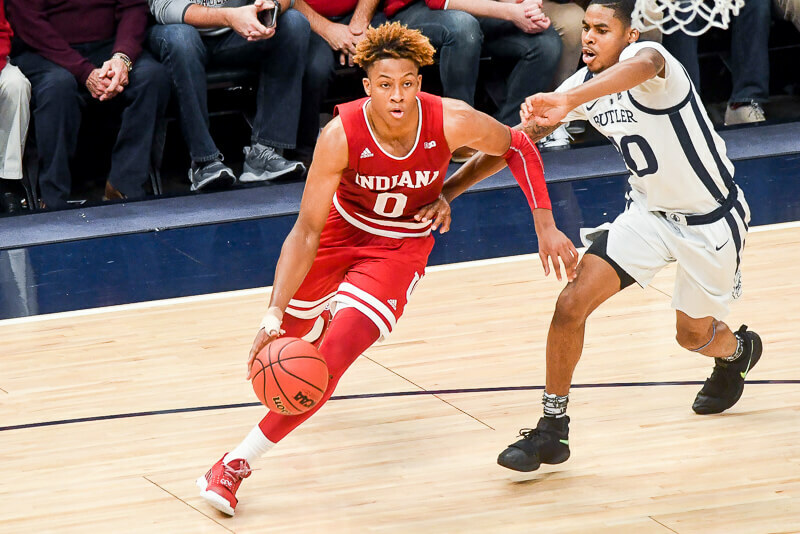 Indiana freshman guard Romeo Langford will declare for the 2019 NBA draft, Inside the Hall has confirmed. The news, which has been expected since Langford arrived on campus last June, was first reported on Thursday by Jonathan Givony of ESPN.com. At this point, Langford, who averaged 16.5 points in 32 games for the Hoosiers, has not hired an agent. He was an All-Big Ten second team selection this season and was also named to the league’s All-Freshman team. In addition to the news that he will declare for the draft, Langford also revealed Thursday that he played with a torn ligament in his thumb for most of his freshman season. The NBA draft early entry deadline this year is April 21 at 11:59 p.m. ET and the deadline to withdraw is May 29. The deadline for underclassmen to submit their names for an evaluation from the Advisory Committee is April 11 at 11:59 p.m. ET. Langford missed Indiana’s three NIT games last month with a back injury that he sustained in a Big Ten tournament loss to Ohio State at the United Center in Chicago. If Langford remains in the draft, Indiana will now have three scholarships available to fill this spring.